By Father John McKenna, C.Ss.R. 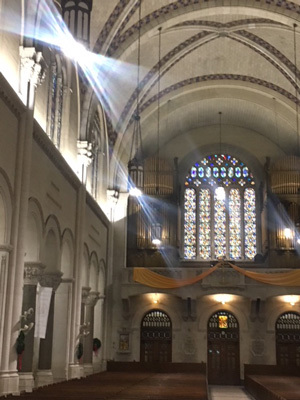 Recently the Basilica of Our Lady of Perpetual Help in Brooklyn got a delightful surprise, a wonderful windfall. It turned out that for a very long time we’d been paying a utility bill that wasn’t ours. The power company, Con Edison, returned a large amount of money to the parish, just at the right time, during our 125th Jubilee Year. This this unexpected good fortune has made possible the new LED lighting now being installed in the upper church. Improving the lighting was on our wish list, but we thought we’d have to wait a few years. But now, our windfall means we’ve already paid for it. That’s like the message the angels gave the shepherds in the fields around Bethlehem: “Good news of great joy for all the people” (Luke 2:10). 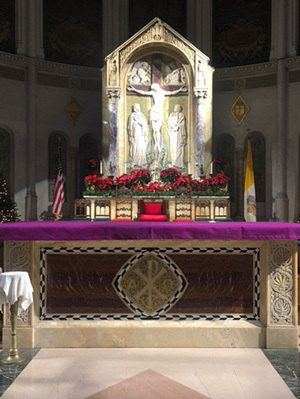 With our new, more efficient, brighter lighting, the stunning beauty of our beautiful basilica is even more apparent and will make us appreciate even more those who went before us—the generations who dreamed and sacrificed to surround us with beauty and made the upper church a little piece of heaven on earth. When the contract was signed to build the upper church in 1924, the price tag was $1.8 million. In 2017 dollars, that would be more than $25 million. It’s our responsibility to care for this treasure and to continue to serve God and God’s people with great sacrifice and generosity.